We don’t recommend carrying your flowers in your back pocket – although it worked for Morrissey in his early days! – but we do recommend finding new places to enjoy flowers. What about a vase on your office desk, to help you get through a long week at work? Or perhaps in the bathroom, so you can watch the buds open while you brush your teeth? 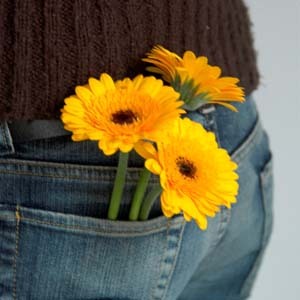 These yellow gerbera show you are someone who wants to experiment and be spontaneous!